To review the American register of yacht clubs online, follow the link and click on “Members Only”. Enter the WHC “User ID: and Password:” located on the bottom of your Reciprocal Courtesy Card 2018. Your card is in the April mailing from Hyde, along with your parking stickers. It’s always a great idea when traveling to hook up with a local Yacht Club! Remember some clubs have their own restrictions so check the club you plan to visit prior to casting off. For example, the Chicago Yacht Club does not honor our cards because of our proximity to their club. Lastly, don’t forget to bring your card for entry! Club Manager, Jeri Traub, can provide a Sheridan Shore Yacht Club burgee upon request for this purpose. Approach the other Yacht Club lounge with your Sheridan Shore Yacht Club burgee and request an exchange. The idea is they place our flag in their lounge, and give us theirs to place in ours. 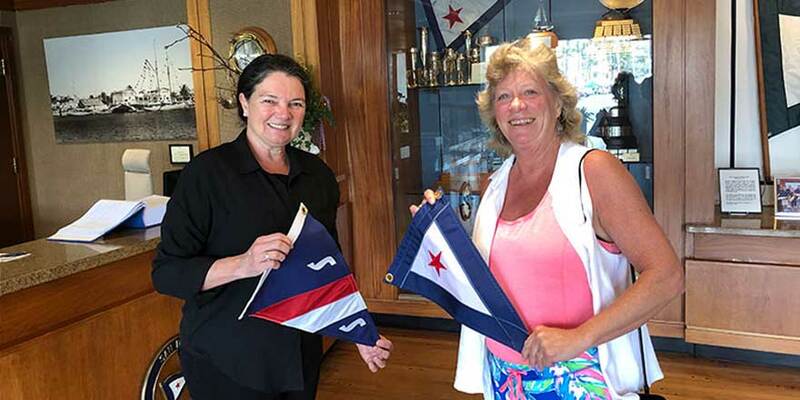 WHC member, Marlene Hines, is featured in the photo doing a burgee exchange.